Community 1st Oldham continues to support healthy living in Oldham with its sponsorship of the ‘Oldham Sport Active’ project. 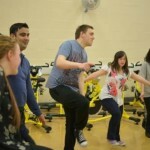 Since January 2014 over 400 young people and families from Oldham’s diverse communities have been taking part in the new sport sessions on offer by Oldham Community Leisure via the project. This represents half of the target number set for year 1. The sessions have been made possible with funding from Sport England`s Community Activation Fund and additional funding from Community 1st Oldham. Sessions so far have included climbing, rounders, badminton, Thai boxing, exercise to music, running and swimming and diving lessons. A highlight for the spring time sessions has been working with the Oldham College disability groups, and the funding has enabled Oldham Community Leisure to deliver a range of sporting activities to the students that have included badminton, indoor climbing, exercise to music, football and spinning, with the students being encouraged to take up activities that they would not normally have the opportunity to do. Community 1st is delighted at the continuing success of this project and proud to be supporting Oldham Community Leisure to deliver it.